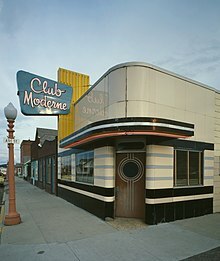 Streamline Moderne is an international style of Art Deco architecture and design that emerged in the 1930s. It was inspired by aerodynamic design. 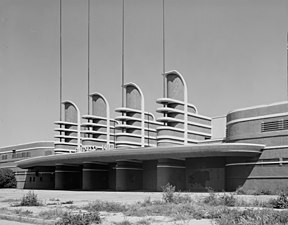 Streamline architecture emphasized curving forms, long horizontal lines, and sometimes nautical elements. 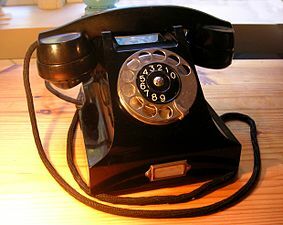 In industrial design, it was used in railroad locomotives, telephones, toasters, buses, appliances, and other devices to give the impression of sleekness and modernity. 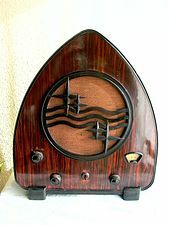 In France, it was called the Style Paquebot, or "Ocean liner style", and was influenced by the design of the luxurious ocean liner SS Normandie, launched in 1932. 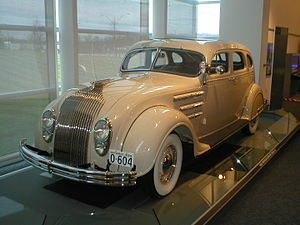 As the Great Depression of the 1930s progressed, Americans saw a new aspect of Art Deco, i.e., streamlining, a concept first conceived by industrial designers who stripped Art Deco design of its ornament in favor of the aerodynamic pure-line concept of motion and speed developed from scientific thinking. 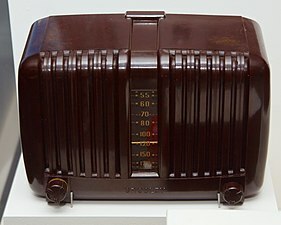 The cylindrical forms and long horizontal windowing in architecture may also have been influenced by constructivism, and by the New Objectivity artists, a movement connected to the German Werkbund. 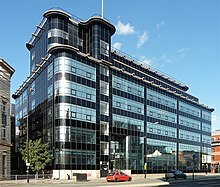 Examples of this style include the 1923 Mossehaus, the reconstruction of the corner of a Berlin office building in 1923 by Erich Mendelsohn and Richard Neutra. 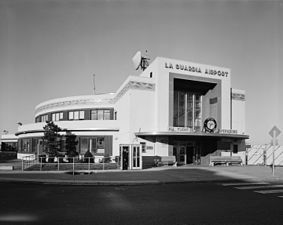 The Streamline Moderne was sometimes a reflection of austere economic times; Sharp angles were replaced with simple, aerodynamic curves. 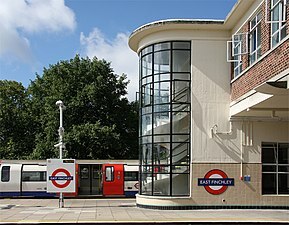 and ornament was replaced with smooth concrete and glass. 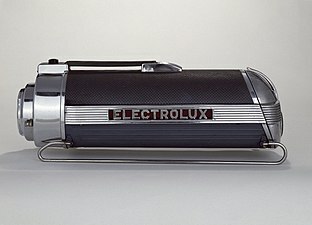 The style was the first to incorporate electric light into architectural structure. 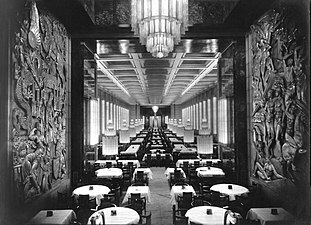 In the first-class dining room of the SS Normandie, fitted out 1933–35, twelve tall pillars of Lalique glass, and 38 columns lit from within illuminated the room. The Strand Palace Hotel foyer (1930), preserved from demolition by the Victoria and Albert Museum during 1969, was one of the first uses of internally lit architectural glass, and coincidentally was the first Moderne interior preserved in a museum. 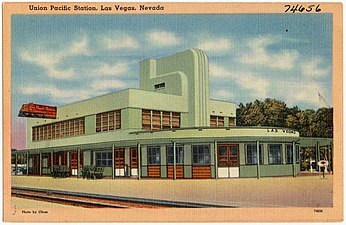 Streamline moderne appeared most often in buildings related to transportation and movement, such as bus and train stations, airport terminals, roadside cafes, and port buildings. 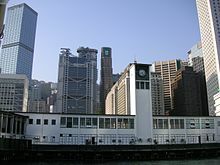 It had characteristics common with modern architecture, including a horizontal orientation, rounded corners, the use of glass brick walls or porthole windows, flat roofs, chrome-plated hardware, and horizontal grooves or lines in the walls. They were frequently white or in subdued pastel colors. An example of this style is the Aquatic Park Bathouse in the Aquatic Park Historic District, in San Francisco. 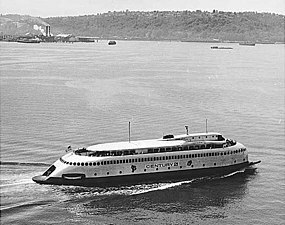 Built beginning in 1936 by the Works Progress Administration, it features the distinctive horizontal lines, classic rounded corners railing and windows of the style, resembling the elements of ship. The interior preserves much of the original decoration and detail, including murals by artist and color theoretician Hilaire Hiler. 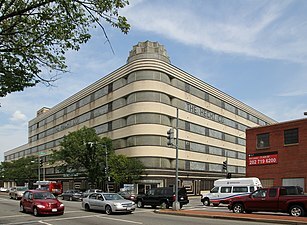 The architects were William Mooser Jr. and William Mooser III. 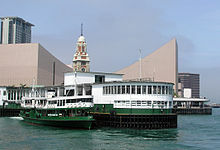 It is now the administrative center of Aquatic Park Historic District. The Normandie Hotel, which opened during 1942, is built in the stylized shape of the ocean liner SS Normandie, and it includes the ship's original sign. 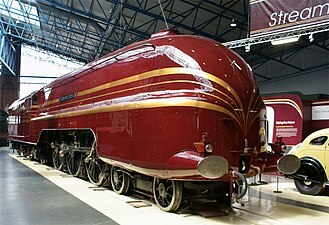 The Sterling Streamliner Diners were diners designed like streamlined trains. 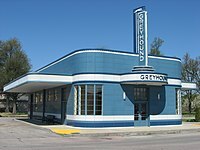 Although Streamline Moderne houses are less common than streamline commercial buildings, residences do exist. The Lydecker House in Los Angeles, built by Howard Lydecker, is an example of Streamline Moderne design in residential architecture. In tract development, elements of the style were sometimes used as a variation in postwar row housing in San Francisco's Sunset District. 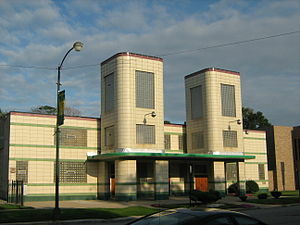 Streamline Moderne church, First Church of Deliverance, Chicago, IL (1939), by Walter T. Bailey. Towers added 1948. 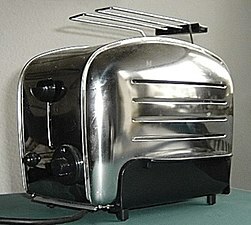 In France, the style was called Pacquebot, or ocean liner. The French version was inspired by the launch of the ocean liner Normandie in 1935, which featured an Art Deco dining room with columns of Lalique crystal. 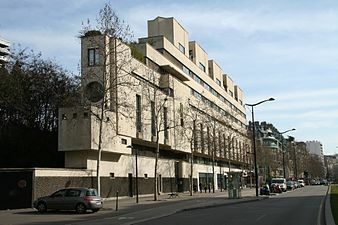 Buildings using variants of the style appeared in Belgium and in Paris, notably in a building at 3 boulevard Victor in the 15th arrondissement, by the architect Pierre Patout. 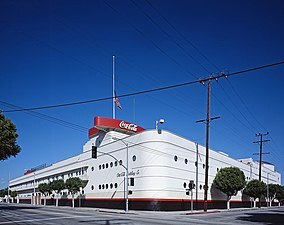 He was one of the founders of the Art Deco style. 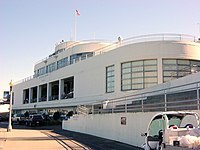 He designed the entrance to the Pavilion of a Collector at the 1925 Exposition of Decorative Arts, the birthplace of the style. He was also the designer of the interiors of three cruise ships, the Ile-de-France (1926), the l'Atlantique (1930), and the Normandie (1935). 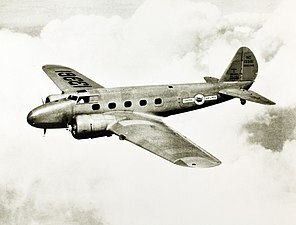 Other later examples include the 1950 Nash Ambassador "Airflyte" sedan with its distinctive low fender lines, as well as Hudson's postwar cars, such as the Commodore, that "were distinctive streamliners—ponderous, massive automobiles with a style all their own". 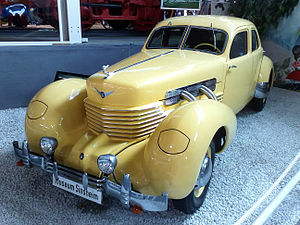 The 1934 Tatra 77 was the first serial-produced truly aerodynamically designed automobile. 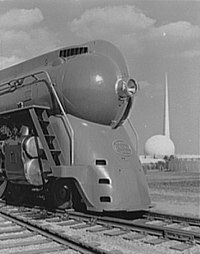 Streamlining became a widespread design practice for aircraft, railroad locomotives, and ships. 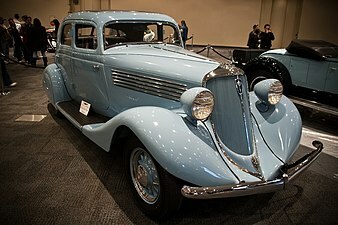 Streamline style can be contrasted with functionalism, which was a leading design style in Europe at the same time. One reason for the simple designs in functionalism was to lower the production costs of the items, making them affordable to the large European working class. Streamlining and functionalism represent two different schools in modernistic industrial design. 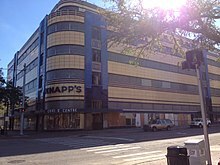 1936: Campana Factory, historic factory in Batavia, Illinois. 1937: Hecht Company Warehouse, Washington, D.C.
^ "A true example of Streamline Moderne". Times of Malta. 6 September 2012. Archived from the original on 1 April 2016. ^ Oudin, Dictionnaire des Architectes, Sechiers, Paris, (1994), (in French), page 372. ^ Texier, Paris Panorama of Archicture, Parigramme, (2012). pg. 142. ^ "1948 Hudson Models - Tech Pages Article". Auto History Preservation Society. Retrieved February 14, 2018. ^ Reed, Robert C. (1975). 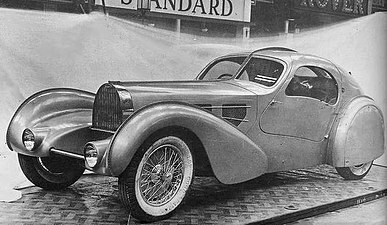 The Streamline Era. San Marino, California: Golden West Books. ISBN 0-87095-053-3. ^ Nickelsen, Trine (15 June 2010). "Aluminium – en kulturhistorie" (in Norwegian). Apollon. Retrieved 17 February 2015. ^ a b Bettsky, Aaron (15 July 1993). "A Hollywood Ending for Those Who Take This Elevator to the Top". Los Angeles Times. Retrieved 17 February 2015. ^ Bos, Sascha (16 July 2014). 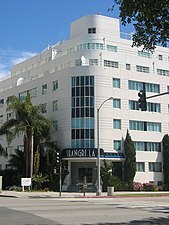 "Historic 1938 Building Could Complicate Massive WeHo Development". LA Weekly. Retrieved 17 February 2015. Texier, Simon (2012). Paris- Panorama de l'architecture. Parigramme. ISBN 978-2-84096-667-8. Oudin, Bernard (1994). Dictionaire des Architectes. Seghiers. ISBN 2-232-10398-6. 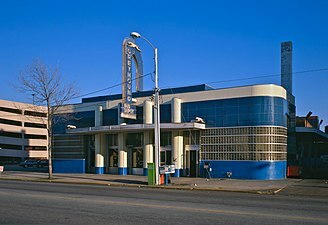 Wikimedia Commons has media related to Streamline Moderne architecture.